I have LOVED this tree from the Serenade cartridge ever since I first saw it. Since I have that cartridge, and hadn't gotten a chance to use it yet, it was pretty simple to pick what I wanted to be my first cut from the cartridge! 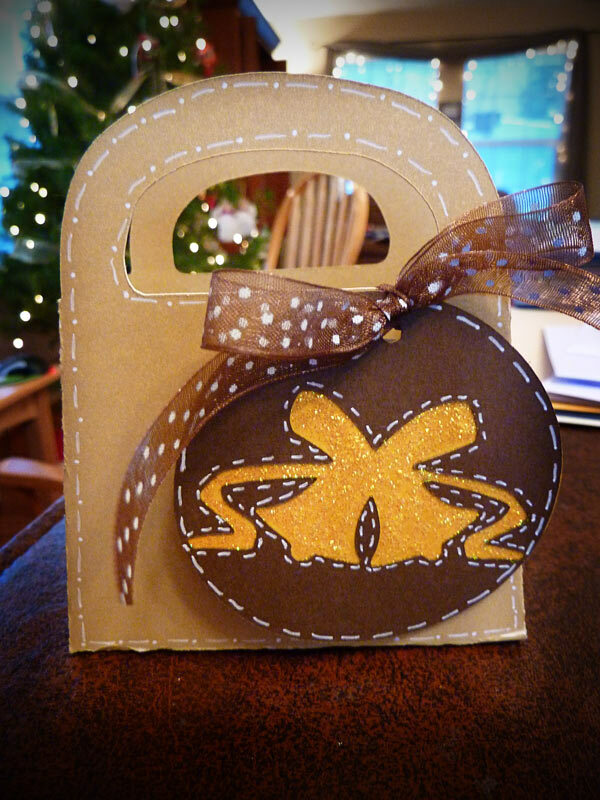 The background shape came from Lacey Labels, then I added some Glossy Accents to the leaves. Stamped the sentiment from a stamp in my stash, added some ribbon, and finished with a little bling with my Jolee's Heat Set tool. Just a quick one to share today. Made this one with one of my Unity Stamp sets. Stamped it in deep red ink (I think the color is called rhubarb - love that, it makes me hungry! ), then filled it in a little with my white gel pen. 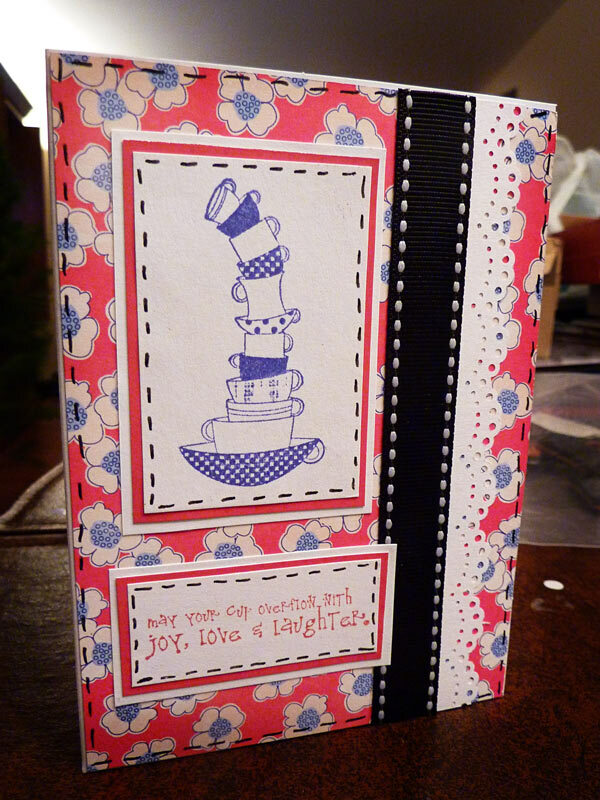 Did a little faux stitching, added some ribbon with a Prima flower and button, and there it was! Good morning! Branched out yesterday and combined two of my favorite things: Unity stamps, and my Cricut! The banner at the top I stamped with my Unity stamp set, then cut out by hand. Added a cute owl from Straight from the Nest - with a Peachy Keen face, of course! 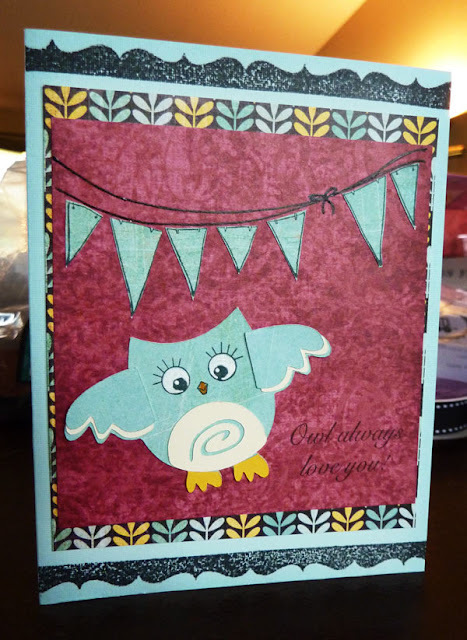 - and a sentiment from My Pink Stamper's Tweetie Hoo Puns set. Thanks for looking! 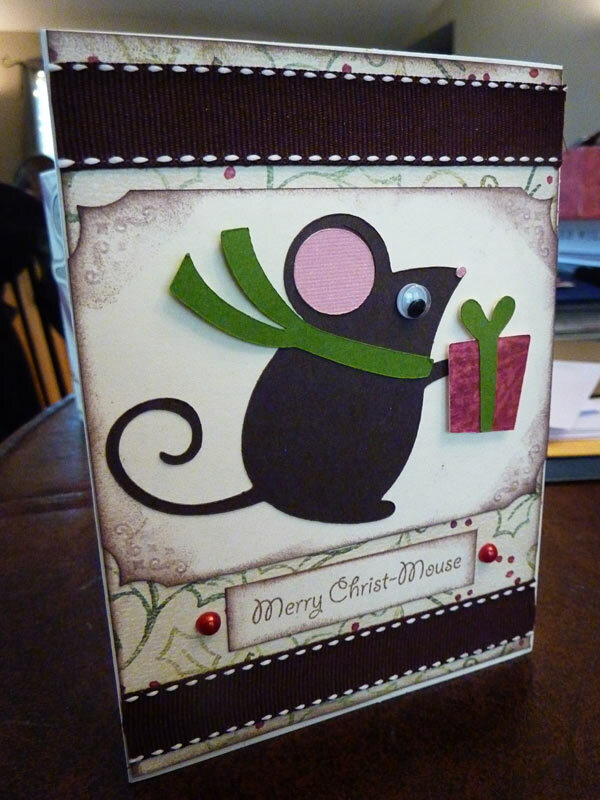 Didn't plan on making a card today...it just kinda happened! I was looking at the weekly challenge on the Cricut Circle blog, and started to think about this set ofstamps by Crafty Secrets I have had in my stash for a bit that I ordered from JoAnns. Hadn't had a chance to use them, and this morning I sat down for a second, because I suddenly wondered what it would look like stamped on patterned paper. Next thing I knew I was coloring it in...just to see what it looked like...then I grabbed the blue from in front of me to mat it...before I knew it, I had my Cricut Birthday Bash cartridge out to cut the shaped card out!!! Added a little doodling, and some stick on pearls, and whether I planned it or not - I had a card!!! I am really happy with it too - double bonus!!! The first one used, of course, Unity Stamps, for the boots and rain, as well as the background behind it. 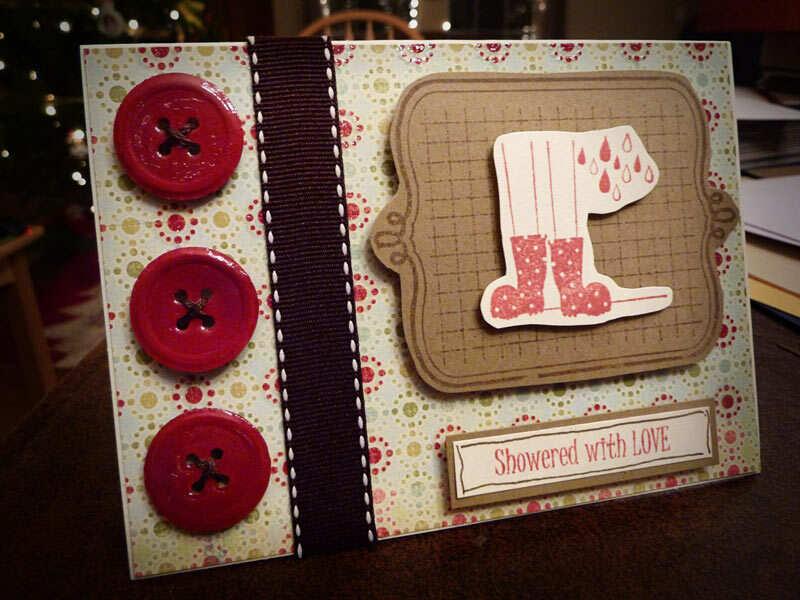 Added a sentiment from my Pink by Design stamps, some buttons that I punched with my Martha Stewart Button punch and added Glossy Accents too, and a bit of ribbon. 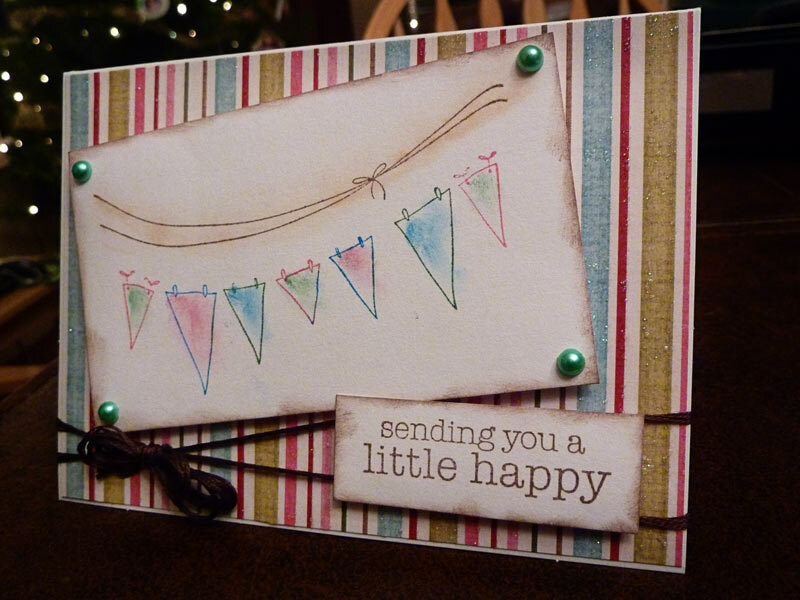 Fourth and final one has Cuttlebug on the background, a bit of ribbon, and a sentiment from Pink by Design stamps. The ladybug and the flower were both from the Unity Stamp set. Hope your Christmas was wonderful!!! First of all - I want to wish everyone a MERRY CHRISTMAS!!! Can't believe that it is Christmas Eve already! 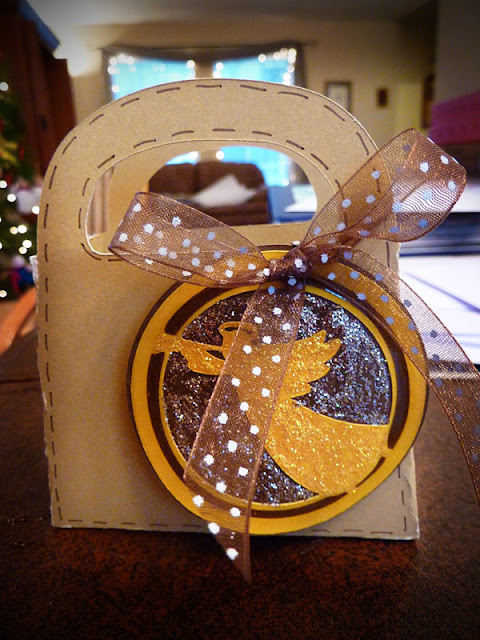 Just thought I would quickly share a couple of gift bags I made last night and finished up this morning. We are giving a couple of gift cards this year, and I wanted to make something extra special to hold them, since I always feel like I am cheating when I give gift cards! 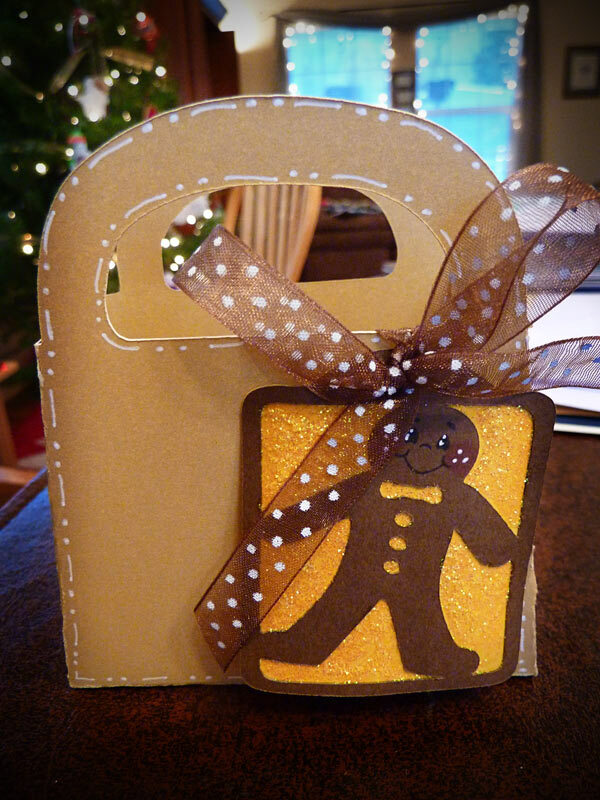 The bags were cut from Tags, Bags, Boxes and More - one of the new free downloads that I hadn't used yet! The first two tags were cut from Very Merry Tags - with Stickles on both, and doodling on the bell one, and a Peachy Keen face on the gingerbread man. 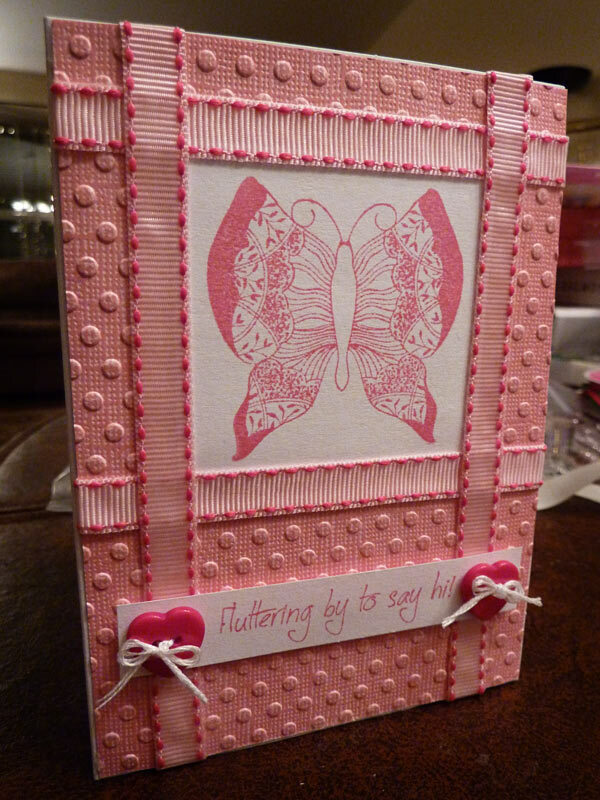 The last tag came from Inspired Heart, and has lots of Stickles and a bit of Glossy Accents around the outside. Tied all three tags on with a ribbon. Thanks for looking - and hope you have a Wonderful Christmas tomorrow!!! Blessings to you and your family! Well...I was pretty bad this year, and didn't get my Christmas cards done, but today my two daughters and I made cookies for our 3 neighbors (they have been begging for weeks to do that for them!) and they all had to have a card to go with them. 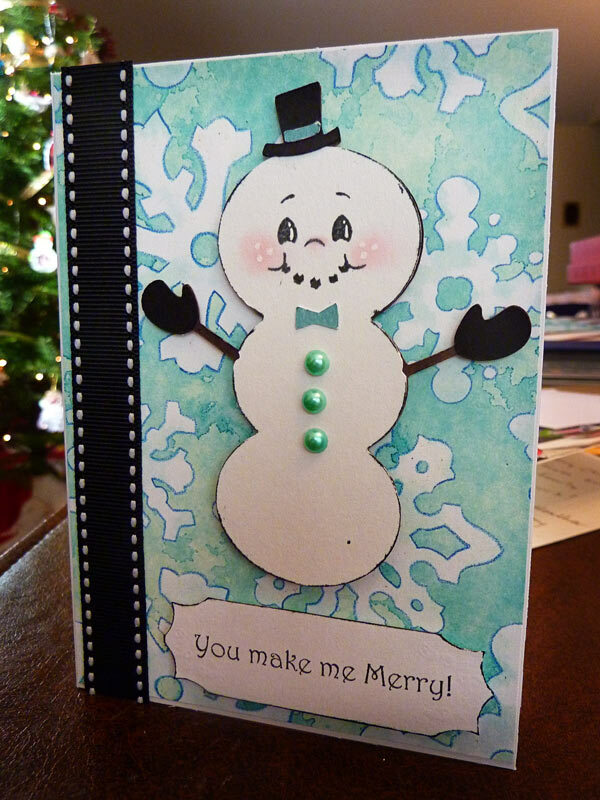 So Katie, my oldest daugher (age 7) sat down with me and helped me make cards. Boy is she picky!!! When she has an idea in her head of what they should look like, she knows what she wants, and there is no talking her out of it! But that's okay - because she usually has pretty good ideas! I definately see a future cardmaker in the future! The cuts for all 3 cards were from Winter Frolic. The gingerbread man and snowman got a Peachy Keen face added to them, and some pearl buttons as well. The sentiments were all from my Pink by Design stamps. Just added a little doodling, ribbon, and/or inking to finish them off! Not to bad - 3 cards in under an hour! Love it when they are simple and just fly out like that! I'm so excited!!! 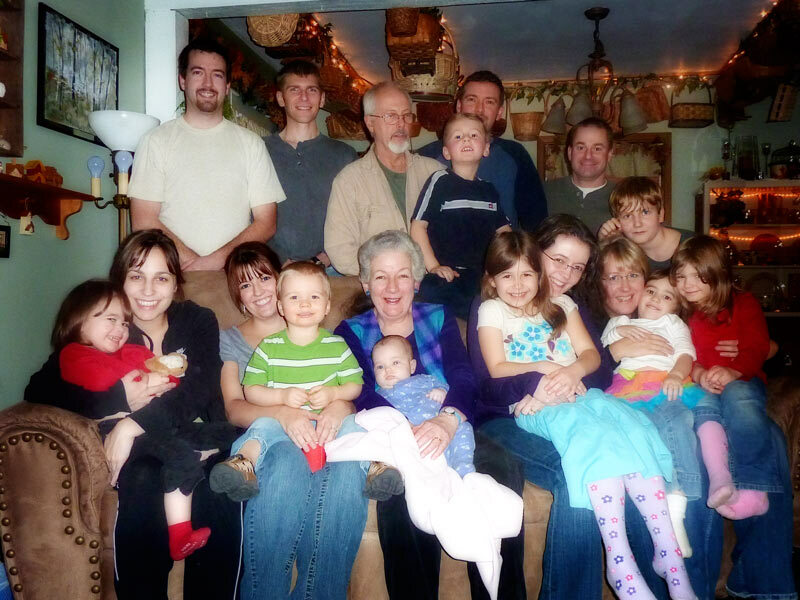 The secret is out - and I can share the news! 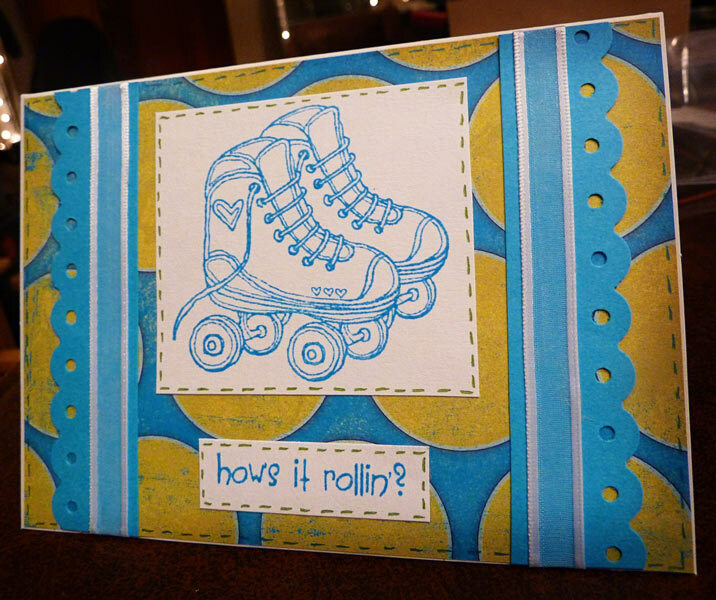 Several weeks ago, one of my FAVORITE companies in the world - Peachy Keen Stamps - put out a call for guest designers. I really didn't think I stood a chance, but figured it was worth a try! Much too my surprise, I was selected to join on as a guest designer for 2011!!! I am very honored - and excited to join all the other wonderful talent out there! The full list is HERE - so feel free to go check out all the other lucky guest designers!!! So...for anyone who might be looking at my blog for the first time, here is a LINK to my very first post that explains why I set this blog up, and what I make all of my cards. In short, it became a project to build houses for widows and orphans in Burundi - and what a journey it has been! I have been so blessed to see how something that started out so small has continued to grow and help others! 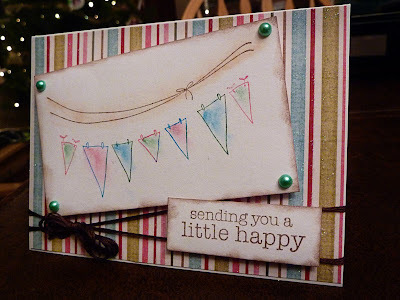 And since I just finished this project for a color challenge on My Pink Stampers blog, and it just so happens to use a Peachy Keen stamp...I thought I would share this tonight as well! The challenge was to use brown, blue, and green (and I had to use a "little" yellow!). 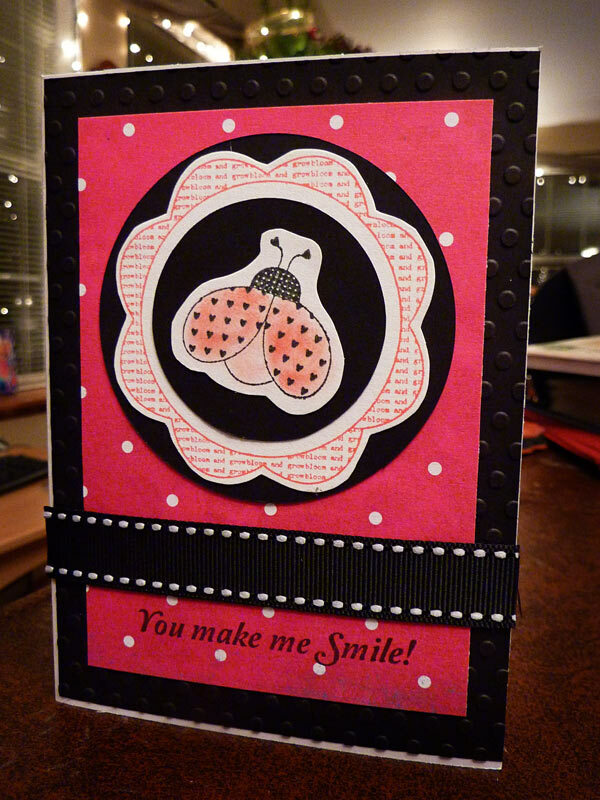 I used the Smiley Cards cartridge, added a face from Peachy Keen's Princess Face Assortment. The candle flames got a dose of Stickles, and the frosting was covered with Glossy Accents. The sentiment is from a Pink by Design stamp set that I just got, and some buttons, string, and doodling finished it all off. Well...can't say that this is my favorite, but it is finished! Ever have one of those, that you just want to like, but can't seem to? Yep...this is one of those! Oh well - guess there has to be some of those too! Used my Unity Stamps again - I think I have finally used every stamp from that one set I got - must mean it is time to get more! Added Prima flowers with a button for the center, some ribbon, and flower border stamp done with white ink and some Stickles for the centers, some white gel pen stitching around the outside. 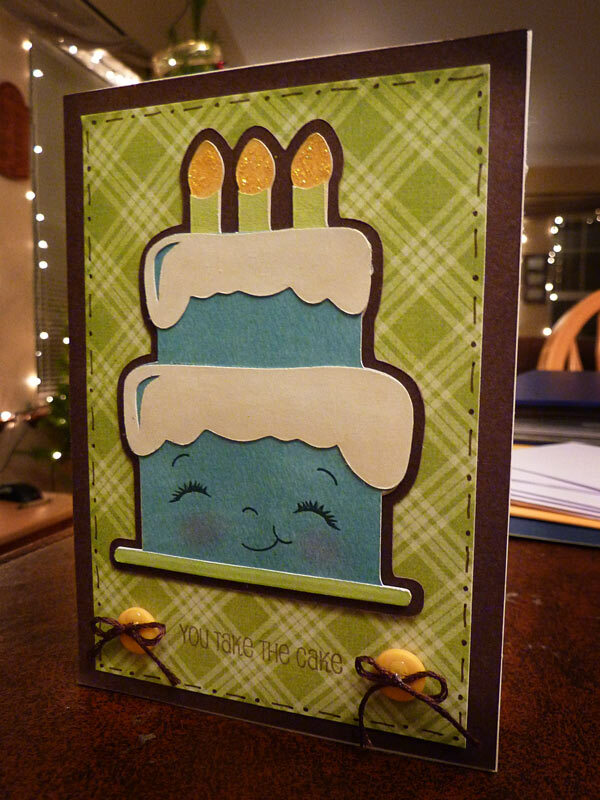 Needed to make a birthday card for my brother-in-law yesterday, so I broke out my trusty Birthday Bash cartridge! 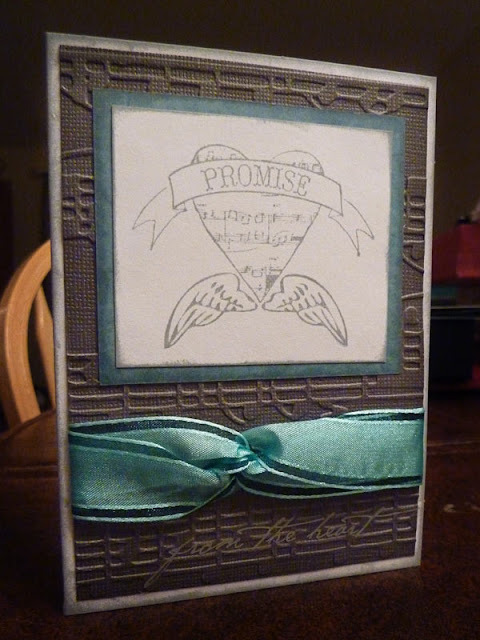 Guy cards are SOOO hard to make, but I think this one came out pretty good! 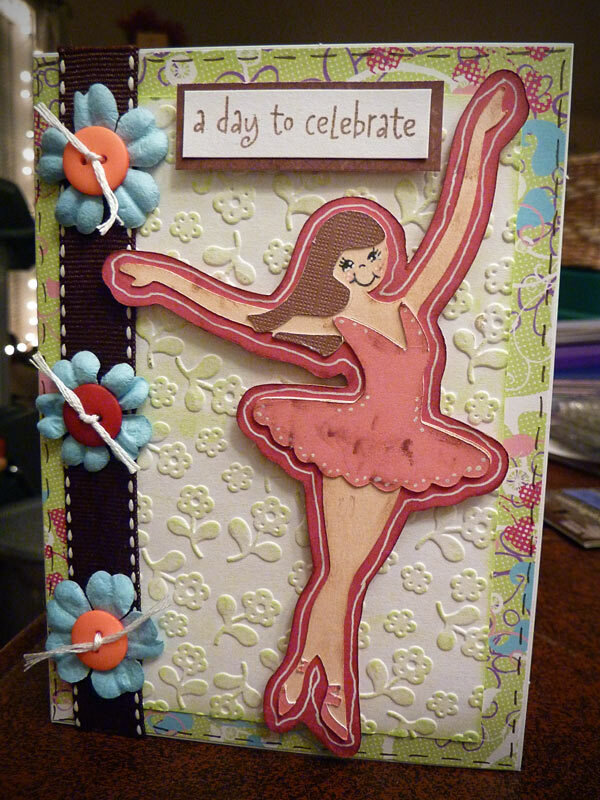 I had just gotten my new set of Pink by Design stamps in the mail too, Take the Cake, so I used that for the sentiment. All cuts came from Birthday Bash. 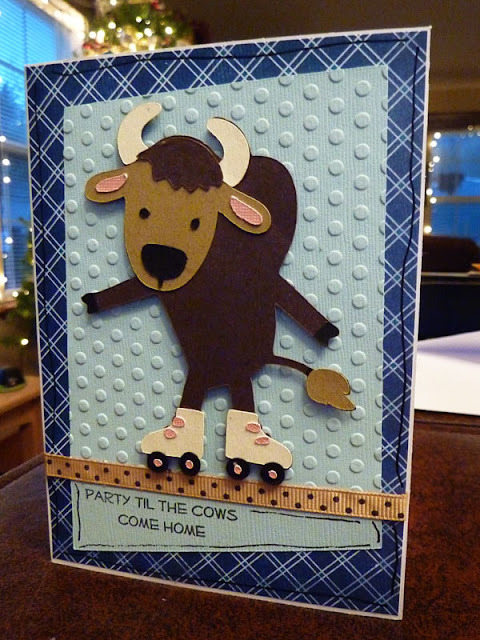 I added a little Cuttlebug to the background, a bit of ribbon, some doodling, and pop-dotted the cow from the background. 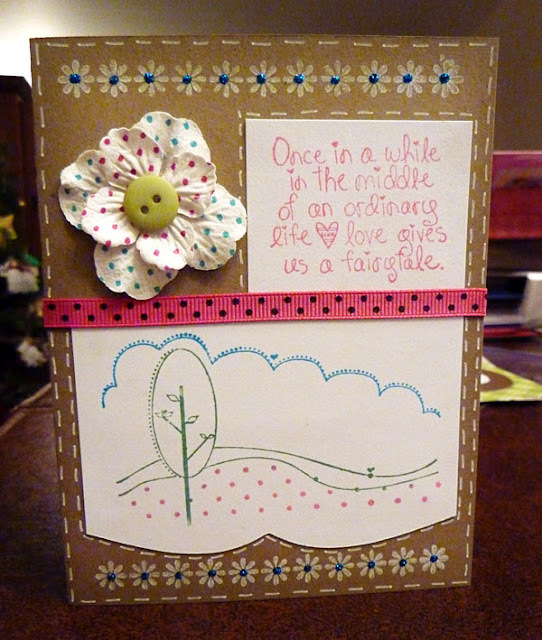 Just a quick card that I made the other day with my Unity Stamps. 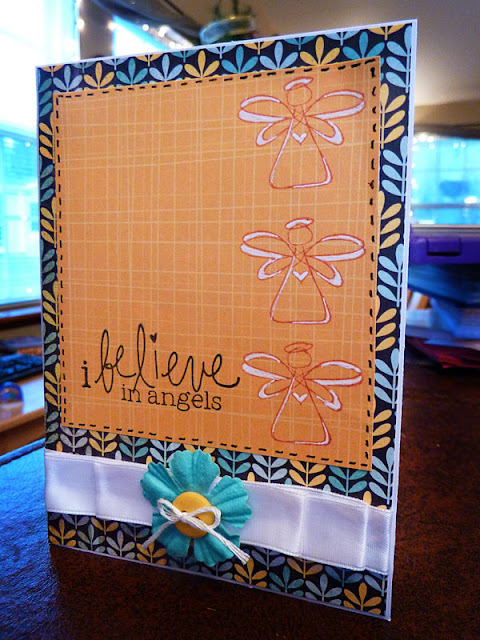 Punched the corners with a Fiskars corner embossing punch, added some ribbon, a Prima Flower with a button center, a bit of string, and some doodling around the edges. Thanks for looking! Loving you more each day! 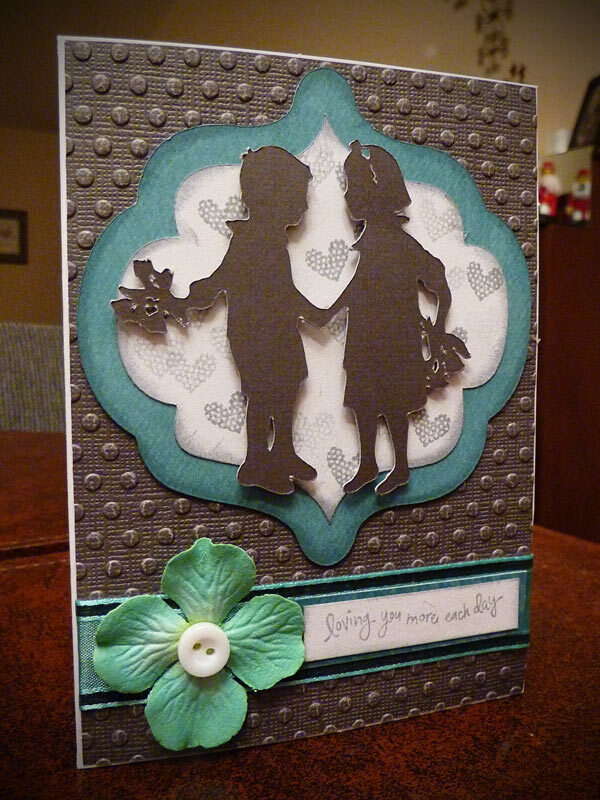 I just love when I picture a card in my head, and it actually comes out looking the way I imagined it! Doesn't always happen, but I got lucky on this one! The background shape came from the tag feature on Winter Frolic, the little girl and boy shape is from A Child's Year and pop dotted from the background, used the Cuttlebug on the background, some ribbon, a Prima Flower with a button for the center, a stamped sentiment from my stash, and lots of gray inking. This card is for a color challenge over on My Pink Stamper's blog. You had to create something using two shades of blue, two shades of pink, and black. Now...this card doesn't have MUCH black, but it does have a little on the faces on the stars! And I think I used about 3 shades of blue too! The colors were pretty non-traditional for Christmas, but I was really in the mood to make a Christmas card, so this is what happened! 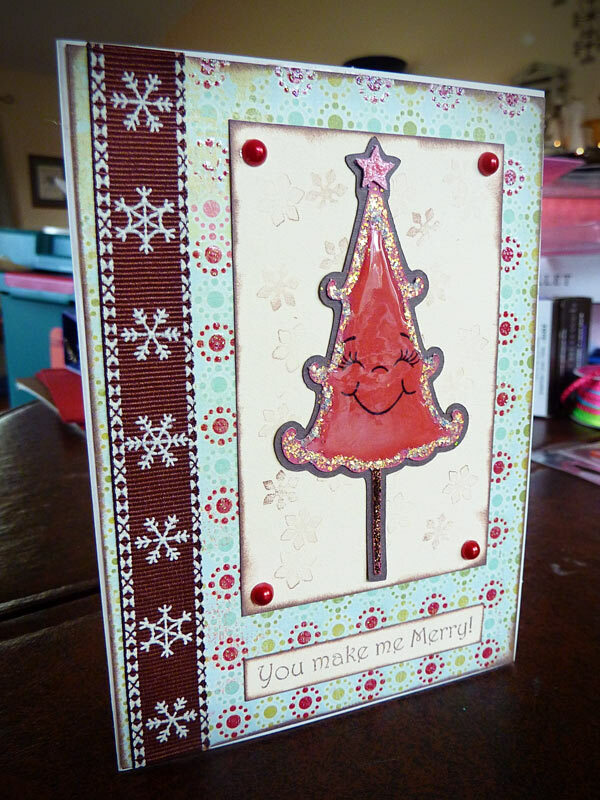 I used Winter Frolic's border feature for the stars and then the phrase, added some Peachy Keen Faces, topped them off with Stickles and lots of Glossy Accents, and pop-dotted them both. The picture doesn't show the colors entirely true...the pink is a little more pink thank it looks in the picture, but it is close enough to give you an idea! I'm starting to notice, that when I get something new I kind of get stuck on it for a while before moving on to something else! That is how it has been with these Unity Stamps! This is another one, from the same set. I love all the variety within just ONE set!!! I think my favorite part about this card though, is the bow. It was kind of an accidental discovery...but I really like how it came out! I started in the back, came around front, gave it a twist, and wound it around to the back again - hooray for an easy bow!!! Also added some inking, and the sentiment at the bottom is actually a sticker - cause I couldn't find anything else that fit as perfect! ﻿If I'm not careful, I'm noticing that I might actually start to LIKE using stamps!!! Scary thought!!! This is another one I made using my Unity Stamps, lots of ink, a few stick on pearls, and a little string. 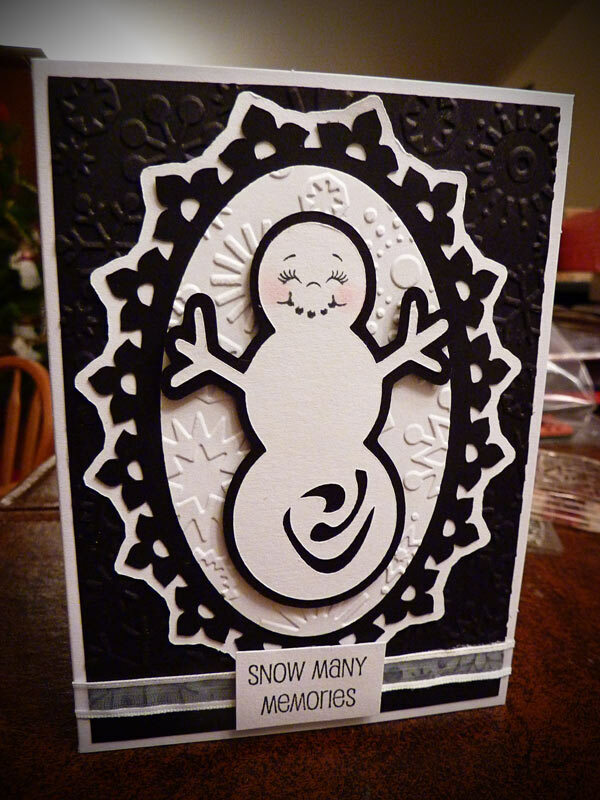 Needed to make a card using cuts from two different carts for a challenge, and for some reason it popped into my head that it would be fun to make a snowman card using only black and white! So...this is the result! 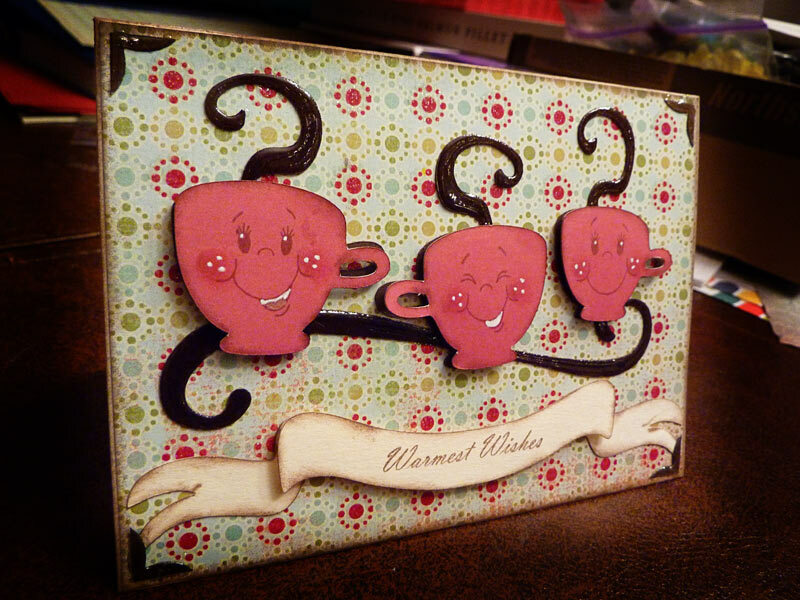 Here is one more I made with my new set of Unity Stamps! 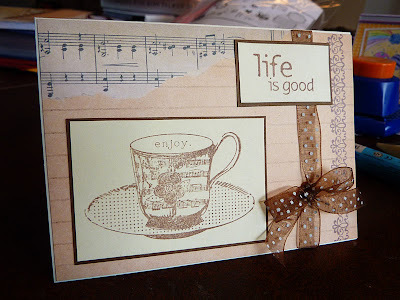 Loved the stack of tea cups, and the sentiment was perfect with them! Been reading about Unity Stamps, and how great they are, so I finally got a little set of them from their sale section. They came in the mail yesterday, so I had to try them out last night! I have gotten to really like clear stamps, so these were a little difficult for me to get used to at first, since it kind of bothered me not being able to see what I was stamping - but they are starting to really grow on me! And I really LOVE the designs and how nice and clearly they stamp! These are from the set I got called "A Little Happy." It is one of the past kits of the month. Both stamped images on the first one came from the set -just added a little paper edged with a Fiskars Edge Punch and some ribbon, along with a little faux stitching. The second one has Cuttlebug on the background, a sentiment from one of my Pink By Design stamps, a couple of buttons, and lots of ribbon! We were without internet the last couple of days, so I was unable to post these as I finished them! Also had an eventful couple of days! My 7 year old daughter fell on a trampoline and broke her two front teeth, and of course, her adult teeth had already come in! So we spent a day at the dentist getting those repaired. Then I spent the day at the doctor and specialist yesterday with another ear infection, fortunately a LOT less severe than the previous one I had a few months ago. Life feels a little back to normal this morning, so I thought I would post these 3 cards I got made over the last couple of days, mostly before the craziness set in! This first one used my Peachy Keen Stamps, one of the cute snowmen from Snow Friends seasonal cartridge (which was the first time I had ever used it! 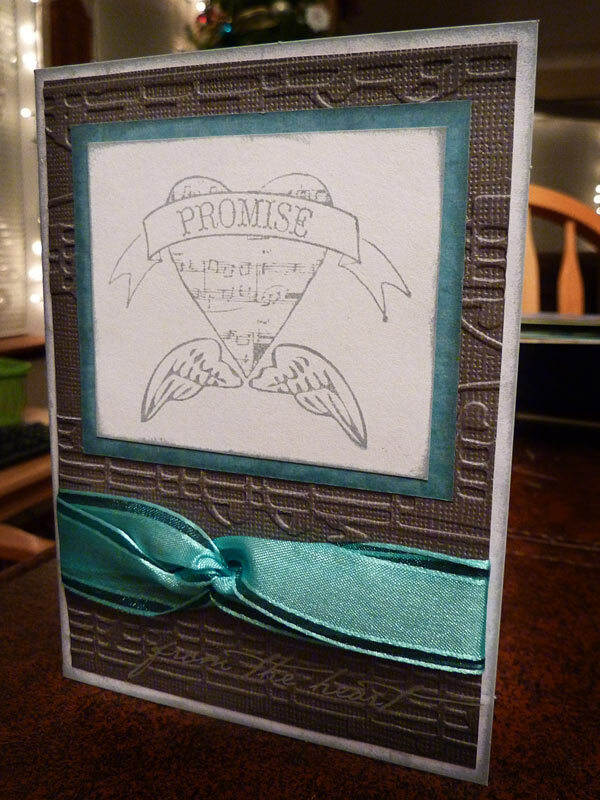 ), a background cut from Lacey Labels (my first Lite cartridge - and first time using it! ), Cuttlebug on the background, lots of inking, some doodling, a little ribbon, and a sentiment from the Pink by Design Winter Fun set. 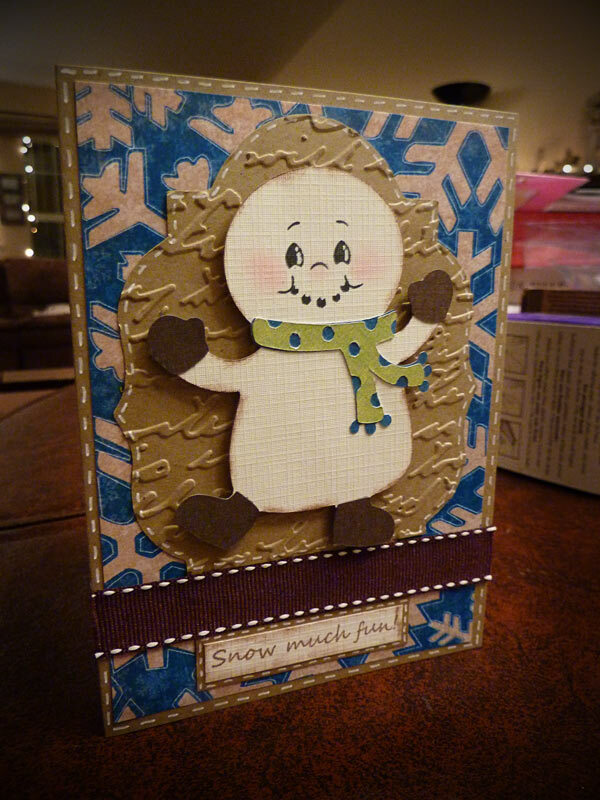 The snowman and the sentiment are also pop-dotted from the card for dimension. This second one was kind of a struggle to finish for some reason. I'm still not sure I'm entirely happy with it, but I don't know what else to do with it! It is for a sketch challenge on the Cricut Circle blog. Anyway, used Lacey Labels for the scallop circle and threaded some ribbon through it with a button at the top. Did a little cuttlebug on an oval to fit in the center, and cut out the ice skater from Winter Woodland cartridge. 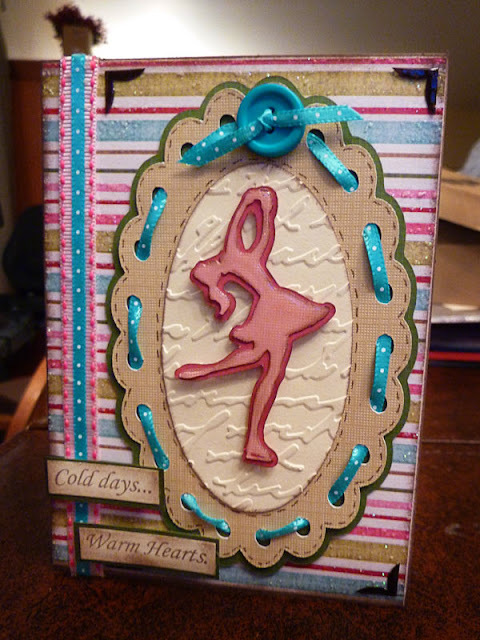 Put ribbon along the side, added a sentiment from My Pink Stamper's Winter Fun set, LOTS of inking, Glossy Accents on the ice skater and the little corner pieces, and pop-dotted the skater and the sentiment. The last one kind of came about a little different than I planned! I had originally cut the tree and added the Peachy Keen Stamp to go on the last card, but it just didn't seem to fit - so I added Stickles and Glossy Accents, and made another card for it! 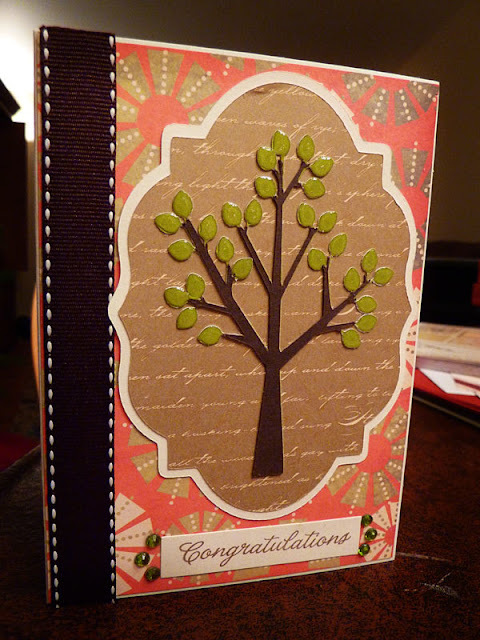 The tree was cut from Joys of the Season - and this card also has a little ribbon, lots of inking, and of course, a My Pink Stamper sentiment. Thanks for looking - and hope you are having a wonderful Christmas season so far! On Black Friday, I had no intention of leaving my house, but I did manage to find a few great deals online! One of them was to order some more face stamps from Peachy Keen Stamps. Besides the great discounts, they also threw in this little stamp for free! So of course, I had to give him a try! I colored him in with colored pencils, used my Cuttlebug to emboss the background, added LOTS of stickles (don't think the picture shows it very well - but it totally sparkles! 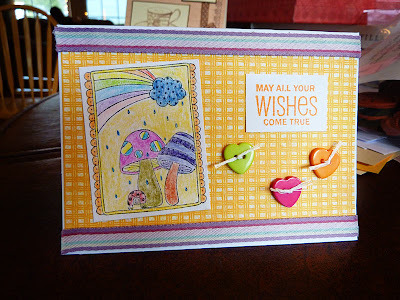 ), some bling with my Jolee's heat set tool, a little doodlin', a bit of ribbon, and a sentiment from my Pink By Design stamps. Funny how sometimes you sit down to make something specific, and when you are done, you have something you love, but it is NOTHING at all like what you planned on! 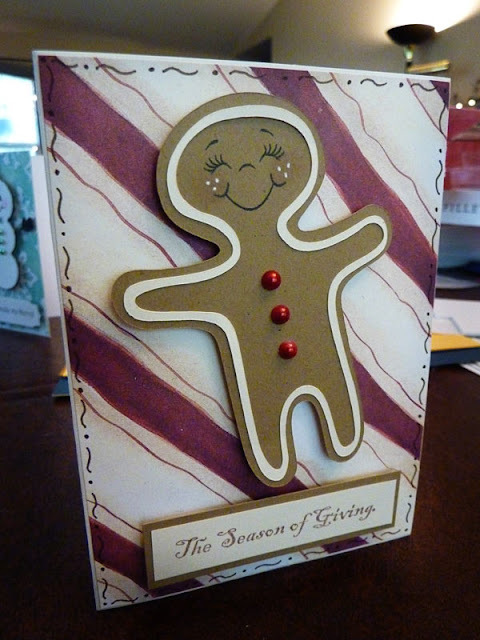 I was going to make a card with either a snowman, gingerbread man, or Christmas lights - and this is what ended up coming from that plan! Nonetheless, I am in love with this one! Had a great day at the craft fair today! Met a lot of WONDERFUL people, enjoyed watching people come through, and my face hurts from smiling!!! Great day - and we came home with another $92 toward a house for a widow! That means that since we began, we have surpassed the halfway mark in building a house - $324.50 toward the $600 needed!!! YAY!!! I put a picture below of our table set up and decorated, and my oldest daughter (age 7) who stayed with me the whole 7 hours, and was a GREAT helper! We had a great time spending the day together! My youngest (age 6) stayed home with Daddy...which is good, since she doesn't have near the patience and attention span! ﻿Whew! Been a busy week, and for the first time since I started this blog, I haven't been able to make anything, and therefore post anything, for several days! 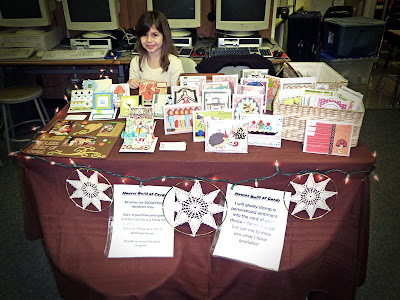 Anyway, I am getting ready to go do a craft fair at a local school tomorrow, and taking all of my cards over there! 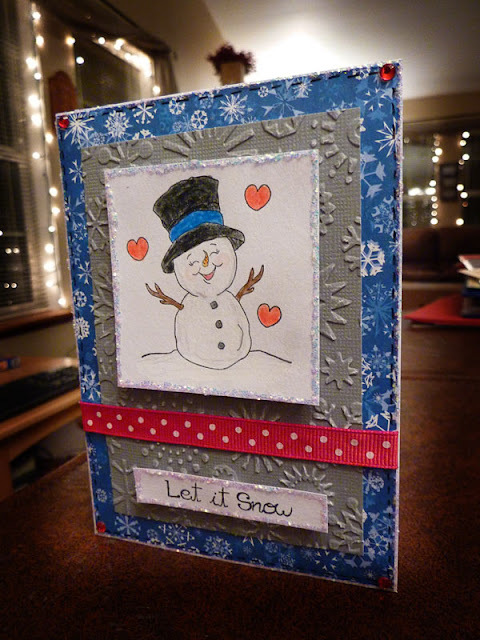 I have about 60 cards made, and decided to not try to cram in as many more as I could make this week - but just to use what I had. Good thing too, since I haven't been able to find any spare time! 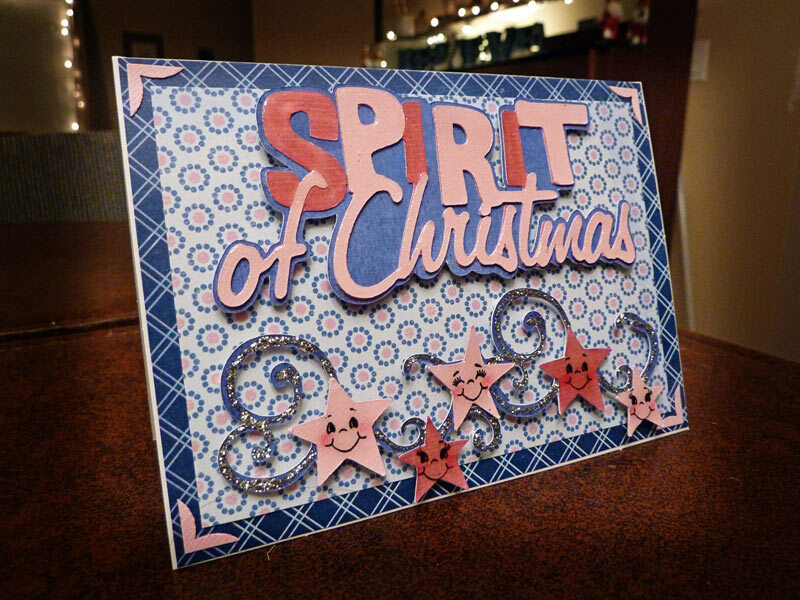 All proceeds from the cards will continue to go to Sister Connection (see HERE for my first blog post, that explains more!) so I figure it is in the Lord's hands, and I will just have fun! Taking my 7 year old daughter to help as well, so we will have a great time spending the day together! 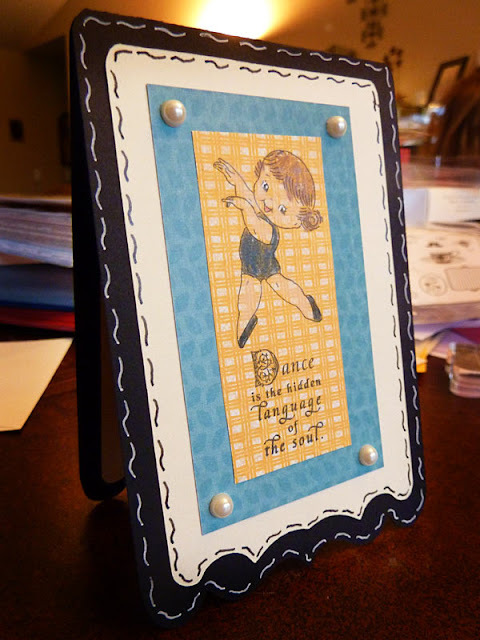 Anyway, got my 2 new sets of Peachy Keen faces today, that I ordered on Black Friday, so I decided to try another card with the Shall We Dance cartridge. I really LOVE this cartridge, but not so fond of the faces. Peachy Keen sets are PERFECT for fixing that small flaw though! This one came from the Dolly Dumplin assortment. 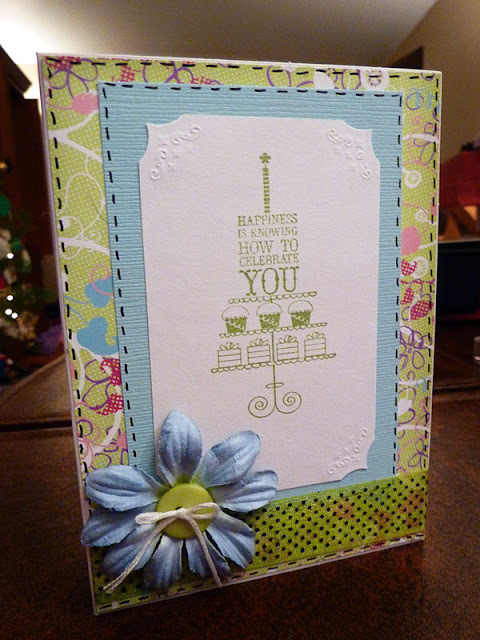 A little of everything on this card...doodling, stamped sentiment, inking, Prima flowers, buttons, used a Sizzix folder through my Cuttlebug (completely interchangeable, by the way! ), and pop-dotted the dancer. Thanks for looking! Blessings!